“I quit my day job!” Over the years, I’ve heard that comment a few times from authors. Very few. And those words would be greeted with applause and fawning. Quitting the day job, after all, is in writer speak or actor speak or any creative-entrepreneur-in-competitive-field speak proof that you have overcome great odds and have made it to the show. The big league. (Had to sneak some pro baseball jargon into the mix.) It’s fulfillment of the dream that one day you will be able to fully support your family with just your (insert tough creative field here) career. That you’ll finally be able to buy that mansion or private jet. Or that great house on the river where your husband will catch-and-release fish every morning and you’ll sip coffee on the porch swing while you write. Oh, that’s just my dream. For most of us in creative fields, though, little things like mortgages, college tuition, car payments and the pipe dream of retiring without having to live in that car make the day job a necessity. But I would like to make the case today that day jobs are meant to be celebrated. They are second jobs that add to our lives and make careers-of-the-heart possible. Sometimes a day job can even become a second career that nestles itself in your heart as well. Author Isabelle Drake, who just happens to be here with me as I write, agrees. “A day job gives you a chance to be out in the world and not just inside your head,” she said. Drake, who works a college professor of English and writing in her other life, added that for many creative types, a day job provides an opportunity to contribute to society in another way. Some examples include education or nursing. After twenty years of raising my family, much of that time also working from home as a freelance journalist and fiction author, I returned to the regular workforce part-time two years ago. Last year, I made the plunge into full-time work at an elementary school as a paraprofessional, assisting in a program for autistic students. And I love it! This has been some of the hardest and most rewarding work I have ever done. It’s great watching these great kids develop, providing support for them when they need it and celebrating each of their milestones. These students teach me every day about courage, determination and the heart’s ever-expanding capacity to love. But does my day job benefit me as a writer? You know, besides the regular paycheck. Absolutely! Just because I’m not at the keyboard all day doesn’t mean I’m not writing. New ideas are percolating in my head all day long, some good enough to jot down during my lunch hour. Having this job pulls me out of the house and away from coffee shops where I usually write, exposing me to a whole new group of compassionate professionals, who go to work every day hoping to make a difference in children’s lives. These educators and other support personnel have taught me so many things that I not only put to use right away with students but some that I might also use in a story someday. Melissa Erickson, a physical therapist friend from work, even met me for coffee after school to help build the injured hero for my new book, FALLING FOR THE COP, a March 2017 release from Harlequin Superromance. 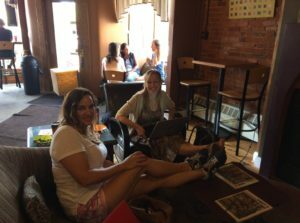 End-of-the-summer writing time at the coffee shop with fellow romance author, Isabelle Drake. 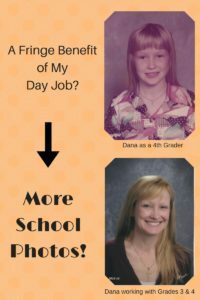 Day jobs have different benefits, and, besides the opportunity to have more funny school photos, mine has one of the best: summers off. That has allowed me to focus on my writing for several weeks and to re-fill my educator well so I will be ready to give the kids my best when school starts. Back-to-school for me is the day after Labor Day, (tomorrow once this note hits the blogosphere), so I met one last time with writer pal, Isabelle, who has already started her classes. We’ll both be writing all year when we’re not in our classrooms.